I've written about my 4th great-grandfather, Dr. Luther L. Waterman, here on my blog before. He was a surgeon in the American Revolutionary War. I was thrilled to find his signature on a document dated August 23, 1776. I shared that exciting find on my blog. If you'd like to see his signature on that special document, click HERE. Today I'd like to share a photo of Luther Waterman's grave marker. I found it on Find A Grave. The photo was taken by a Find A Grave volunteer named Nancy. I'm very grateful to her for taking this photo. Unfortunately, the grave marker is somewhat difficult to read. I can make out the letters DOC above Luther's name. But that's about it. Luther passed away on 9 September 1807 in Cazenovia, Madison County, New York and was buried in the Union Cemetery in Cazenovia. This map shows where Union Cemetery is in relation to Cazenovia. And here's a different map showing Union Cemetery. Rootsweb has a webpage dedicated to the Union Cemetery. 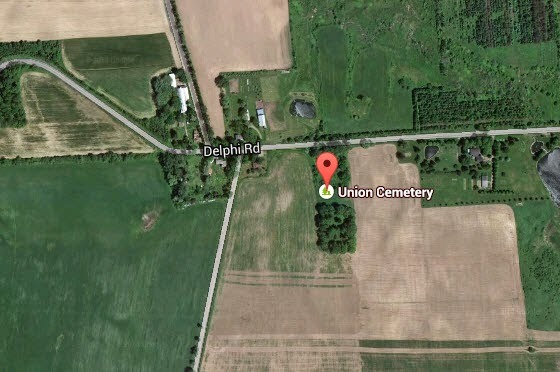 On this website, there's a map showing where the cemetery is located and a plot map as well. There's also a listing of those buried at the cemetery. From the list, it appears that Luther was the only Waterman buried there. I was curious to see the distance from Cazenovia, New York to Coolville, Ohio. I once again turned to Google Maps. You can see the distance between these two cities on the map below. Can you imagine moving this far in the early to mid 1800s? How did the family travel to Ohio? What mode of transportation did they use? Was the trip difficult or easy? In 1838 Phebe was 82 years old. I don't know exactly when she and her family moved to Ohio. But, even if it was ten years earlier, she would have been 72 years old at the time. What must it have been like for her to move hundreds of miles away from her home in New York? Athens County Ohio became the home and/or birthplace of several generations of my Waterman ancestors. These include my 3rd great-grandfather, Asher Waterman, his daughter and my 2nd great-grandmother Cynthia Maria Waterman, and her son and my great-grandfather, Watson (Frederick) Emory Webster. You may recognize Watson's name because he is affectionately referred to as "The Traveling Dentist" here on my blog. In future 52 Ancestors posts, I'm planning on sharing what I know about the children of Luther and Phebe Waterman. In last week's 52 Ancestors post, I introduced you to Phebe Barker, who was the wife of Dr. Luther L. Waterman. Luther and Phebe are my maternal 4th great-grandparents. Today I'd like to introduce you to Luther's father, David Bassett Waterman, my maternal 5th great-grandfather. David Bassett Waterman was born on 9 September 1725 in Norwich, Connecticut to his parents John Waterman and Elizabeth Bassett. He was baptized on 22 September 1725 in Norwich, Connecticut. David married Anne Bartlett. They were the parents of six sons. At least two of David and Anne's sons served in the American Revolutionary War, one of whom was my 4th great-grandfather, Dr. Luther L. Waterman. The Hartford Courant, issue of 4 Oct. 1809: "Died, at Salisbury, Mr. David Waterman, formerly of Norwich, aged 84 years." Salisbury church records: "Mr. Waterman" died of consumption, 26 Sept. 1809, aged 85. These records, with the disappearance of David from Norwich and the reappearance of his family in Salisbury, and family records and traditions, make the identification reasonably certain. I'm really grateful to own the Waterman Family, Descendants of Robert Waterman books by Donald Lines Jacobus. It's a three-volume book series. The family history information in the books is wonderfully sourced by Mr. Jacobus. I'm so glad Mr. Jacobus decided to research and write about my Waterman family. From the information found in Volume 1 of this book, it appears that David Bassett Waterman passed away on 26 September 1809 at Salisbury, Connecticut due to consumption. Unfortunately, I don't know where David was buried. I will be sharing more about my Waterman ancestors in future posts. Last week I received a very nice surprise. I was nominated for the "One Lovely Blog Award" by Randy Seaver, author of Genea-Musings. Thank you so much Randy! I truly am honored to be nominated by you! I'm the oldest of three children. I have two younger brothers. I was named after my father, Jan Albert Iverson. His first name plus the first initial of his middle name equals my name, Jana. I used to watch football with my dad when I was growing up and actually used to play tag football with the neighborhood kids. I still like football to this day and enjoy watching college football with my husband. When I was a kid, my brothers and I, and other neighborhood kids, would ride our bikes to a creek that was behind a nearby elementary school. We would play there and catch crawdads (crayfish) and pollywogs (tadpoles). We would also play lots of games outside during the summer with the neighborhood kids. Those were such fun and carefree days! My brothers and I knew it was time to come home when my dad would whistle. I got my first job the summer after I graduated from high school. I got a job at Standard Oil/Chevron Corporation at their corporate office building in the financial district in San Francisco, California. I worked in the Word Processing Department. I took several business courses in high school, including four years of typing. I can still type at a pretty fast speed to this day. My latest online typing test score was 87 words per minute. While at the Word Processing Department, I worked as a Typist, Senior Typist, Word Processing Operator, Data Entry Clerk, Proofreader, Computer Operator, and I even worked for a brief time in the Photo-Typesetting Department. Before I got married, I was able to take some educational leave so I could attend Brigham Young University. I worked at Standard Oil/Chevron Corporation until my husband and I had our first child. While I attended Brigham Young University, I took ballroom dance classes. I love dancing! While my husband was completing his Electrical Engineering degree at U.C. Davis, I had my own little typing business for a while. I was a stay-at-home mom, but this was a way to earn a little extra money for the family. We had two small children by the time my husband graduated. My typing business was called "The Last Word" typing service. (Yes, a play on our last name, haha!) My clients were college students. Oh, this is a hard one. There are so many awesome blogs out there. It's quite difficult to choose only 15. Thankfully, because I write a weekly Fab Finds post, I still have the chance to feature many of the wonderful blogs I follow and admire in future Fab Finds posts. Thanks again Randy for nominating my blog for the "One Lovely Blog Award!" And thank you to all of my wonderful readers. I appreciate you stopping by and reading my blog. And thank you for your comments too. I know your time is precious, so the fact that you take the time to read and leave comments means so much to me. My maternal 4th great-grandfather, Dr. Luther L. Waterman was a surgeon during the Revolutionary War. This is the second page from his pension file. I've written about Luther before on this blog. Today, I'd like to introduce you to Luther's wife, and my 4th great-grandmother, Phebe Barker. Phebe Barker was born on 22 August 1756 in Norwich, New London, Connecticut. She was the daughter of Dr. John Barker and Phebe Hyde. Phebe married Luther Waterman on 1 January 1778 in Franklin, New London, Connecticut. They were the parents of nine children. Phebe Waterman decd. widow of Luther Waterman who died on the 9 Sep 1807 of Athens Co. in the state of Ohio who was a Surgeon in the Co. commanded by Captain --- of the Reg commanded by Col Webb in the Conn (? Page ripped) for 15 months increased from $300 p. ann. Inscribed on the Roll of Cincinnati ? the rate of Dollars Cents per ann. to commence on the 4th day of March 1834 (? Page ripped) on the 2 Feby. 1843 the day of her d (probably death). Arrears to the 4th of "
Isn't the right side of this pension file page especially wonderful? It lists the children of Luther and Phebe, including the married names of their daughters. Luther passed away on 9 September 1807 in Cazenovia, Madison, New York. Most of Luther and Phebe's children had moved to Athens County Ohio, by the time the 1850 federal census was taken. "The widow Phebe Waterman and her children settled on a farm near Coolville, Athens County, Ohio. It is now on Route 7 out of Coolville. There they laid out a private Waterman graveyard, which is now (1938) on the farm of Mr. John Humphrey, originally part of the old Waterman purchase. One goes from the house through two pastures to reach it. Here there is a stone to the widow, the inscription on which reads: "Phebe Waterman, Consort of Dr. Luther Waterman and daughter of Dr. John Barker, died Feb. 2, 1843, in 87th year." I wonder if the old Waterman graveyard still exists. If so, I think it would be really amazing to visit it someday. As was stated in the paragraph from The Waterman Family book, Phebe Barker Waterman passed away on 2 February 1843. She passed away in Troy, Athens, Ohio. The rest of the story by Debi Austen, author of Who Knew? Remembering 9/11 by Beth Gatlin, author of So Many Ancestors! I believe this is a picture of my maternal great-grandmother, Rosalia Rodrigues Vasques. I cropped it from a larger group photo, which I will share at a later time. I introduced you to Rosalia's husband, Alvaro Borges Da Silva Madeira, in a previous post. If you missed that post and would like to read about Alvaro, who was a Naval Engineer in Brazil, click HERE. Rosalia was born 4 September 1857 to her parents Mathias Rodrigues Vasques and Margarida De Farias Correa. Rosalia was christened on 8 December 1857 in São Pedro, Rio Grande, Rio Grande do Sul, Brazil. Rosalia and her husband Alvaro were the parents of five children. My records indicate that Rosalia passed away on 24 April 1930 in Sao Paulo, Sao Paulo, Brazil at 72 years of age. Tuesday’s Tip: Transcript AND Promoting Your Blog Without (much) Bloodshed by Jenny Lanctot, author of Are My Roots Showing? You know what's fun? Adding another name to my Legacy Family Tree database. But this time I wasn't adding a name because of genealogy research I had done. No. This time I added the name of our lovely new daughter-in-law following the wedding of our second-oldest son and his beautiful bride. And it certainly was wonderful to add her name to our family tree. Our son and his fiancé (now wife) were married in the Oakland California Temple. They were sealed for time and all eternity. Members of the The Church of Jesus Christ of Latter-day Saints believe that marriages performed in the holy temple can last throughout the eternities and not end at death. Our son and daughter-in-law were blessed with gorgeous weather on their wedding day. It was a bit overcast and foggy on our way from our hotel to the Oakland Temple, but it cleared up beautifully. The Oakland California Temple is absolutely beautiful, not only inside, but outside as well. The gorgeous photos I'm sharing with you today were taken by Marielle Hayes, owner of Marielle Hayes Photography. She did a fantastic job photographing the wedding of our son and daughter-in-law. Please check out her website by clicking HERE. In addition to the photos taken around the beautiful Oakland Temple grounds, Marielle took some stunning photos of our son and daughter-in-law along the coast. Marielle was able to prepare eighteen photos for our family to use at the wedding open house we hosted in our area about a week after the wedding. I can't wait to see the rest of her photos! We love our new daughter-in-law already and are so happy she's now part of our family! I'll be sharing more photos of the wedding on my personal blog, Jana's Place. I hope you'll join me there as well. Today I'd like to introduce you to my maternal 2nd great-grandaunt, Jerusha S. Waterman. She was born about 1827 in Ohio to her parents Asher Waterman and Bathsheba Paulk. Her father, Asher Waterman, was a War of 1812 veteran. This photo of Jerusha was found in the photo album of my 2nd great-grandfather, Ebenezer Perry Carlisle Webster, who was a Civil War veteran. Ebenezer was married to Jerusha's sister, Cynthia Maria Waterman. Here's a photo of the page where Jerusha's picture was found in Ebenezer's photo album. The handwriting at the bottom of the album page reads: "Mas Sister Jerusia Dow." If you'd like to see more photos of Ebenezer's photo album, click HERE. Jerusha married William Wallace Dow on 10 June 1857 in Lee County, Iowa. William was a widower with six children, five of whom were living at the time he and Jerusha married. Jerusha's husband William passed away on 9 December 1880. She passed away almost thirteen years later on 19 September 1893 in Persia, Harrison, Iowa at 66 years of age.